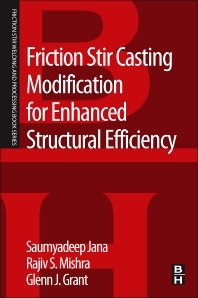 Friction Stir Casting Modification for Enhanced Structural Efficiency: A Volume in the Friction Stir Welding and Processing Book Series summarizes current research and applications of friction stir processing techniques for casting modification. Research in this area has shown significant benefit in terms of fatigue performance as a result of friction stir processing. This book addresses the latest research, providing readers with a summary of these results and new guidelines for designers. Researchers, materials processing engineers, design engineers, welding engineers, machining engineers and students. Dr. Saumyadeep Jana, a staff scientist at Pacific Northwest National Laboratory, works in the area of friction stir welding and processing of various ferrous and non-ferrous alloys. Dr. Jana, a metallurgical engineer by training and profession, studies the correlation between microstructure, joint properties, and processing conditions. Dissimilar metal joining through friction stir welding (FSW), high strength low alloy (HSLA) steel FSW development, aluminum alloy casting modification through friction stir are some of the works Dr. Jana has been greatly involved with. Dr. Jana earned his Ph.D. in Metallurgical Engineering from Missouri University of Science & Technology, Rolla in 2009. During his Ph.D., Dr. Jana investigated the effects of friction stir processing on the fatigue behavior of an automotive grade cast aluminum alloy. To date, Dr. Jana has nine peer-reviewed journal publications and one U.S. patent to his credit. His total citation record stands at 394 with an h-index of 7. Glenn Grant is a Senior Staff Scientist at the Pacific Northwest National Laboratory. His research focus is on the formability, joining, and manufacturing of materials for industrial applications, and in the development of new solid state joining and processing technologies for advanced materials for future energy applications including power generation, hydrocarbon and chemical transport and processing. Mr. Grant has been researching and developing Friction Stir Welding and Processing at the lab since 1997 and during that time has completed numerous studies with industrial partners on the performance of Friction Stir Processed surfaces for improved properties. He currently leads a portfolio of projects investigating Friction Stir Joining and Processing as a new manufacturing technology, and leads programs in solid state compaction and processing of new materials for high temperature and high performance applications. Mr. Grant has over 20 publications on solid state joining and processing and over 29 years’ experience in the microstructural and mechanical characterization of materials and in the exploration of process/property relationships.